FA18 Strike Force is totally addicting action game fun. 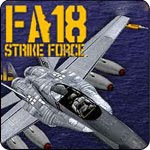 FA18 Strike Force is one of the shooting/action games that will keep you glued to your PC. Gamers, now the fate of a nation is on your hand! Destroy the hostiles and save the day! You are on control of a high performance F18 Hornet fighter jet. From a carrier launch you face off against a non stop barrage of enemy fighters, watch your back and dogfight your way to the top. Pick up powerups as they appear and keep a close watch on your fuel gauge.